Sorry I didn’t get a photo of the bus stop in question, but it was a really awesome “massage parlor”. In the 2008 Singapore-produced documentary, Mad About English, well-meaning residents of Beijing are shown preparing for the arrival of Olympic Games tourists by learning English phrases, often unsuccessfully, which is where most of the somewhat mean-spirited comedy comes from. 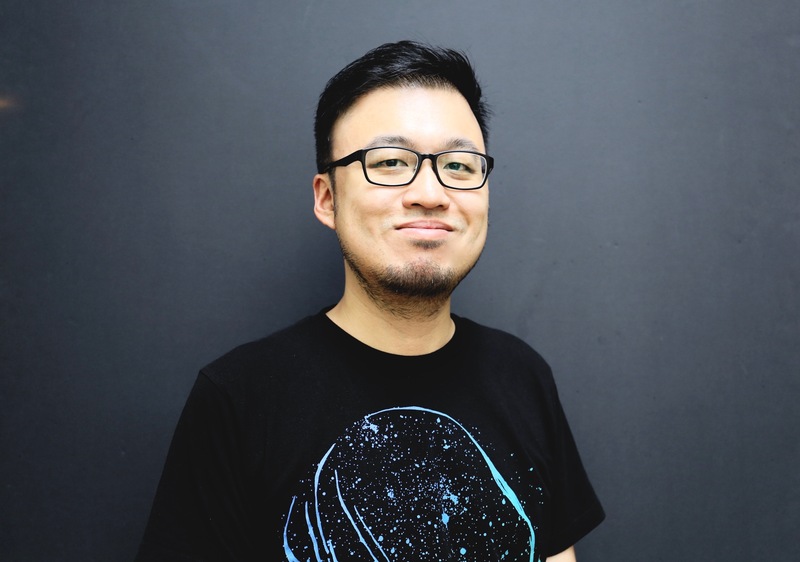 Seen uncynically, the film has its merits, but it is hard to shake the idea that its producers believed the earnest efforts of the Chinese would ever amount to more than very awkward (mis)communication. I could be wrong, basing this on a single viewing, but the repeated images of fervency followed by failure, as well as the film’s title itself, sets off some alarms. The film features no voice-over narration, which is a problem in two possible ways. By explicitly saying nothing (with words) in a documentary format, a director invokes the powerful semiotics of neutrality; it’s a dumbshow of backing off with upheld hands and sealed lips. But, of course, film is not a medium that depends on words for meaning, although we are conditioned by the bulk of documentary features to think that because narration is either truthful or biased, a filmmaker/agenda is powerless without it. Sometimes, the absence of narration can be a red herring. Defenses down, some viewers will inevitably take selective and non-linear editing at face value. What does that leave those listening to Mad About English with? English mangled by foreign accents, accompanied without exception by subtitles. The screening I attended was regretfully punctuated by enthusiastic laughter whenever someone pronounced badly. You’d never see that kind of behavior outside a language classroom, but in a theatre, oh why not? They didn’t need to pay a man with a gravelly voice to ridicule the Chinese students, because you’d notice that, of course. They let them do it to themselves, is the next point. The second implication of a film like this having no commentary, where commentary is especially needed to contextualize and humanize the trials of a culture struggling under the burdens of learning a foreign language, as a matter of upholding national pride, is that it does not speak for those who cannot speak for themselves. One shouldn’t expect common people to eloquently hold forth on the significance of several million people simultaneously taking an interest in English. Or to effectively defend their efforts and point out how they may yet make a difference to visitors’ experiences or perceptions of China, however small. The movie suffers for this, mostly depending on one character near the end (Li Yang aka Crazy English Teacher) to provide analysis. Policies of non-interference are all well and good when a lion kills a zebra on camera, but expecting cab drivers to acquit themselves with grace after a few weak lessons is kinda cruel, and a little too American Idol: Auditions for my tastes. Instead of reading this choice as the filmmakers not having anything to say, it can be argued that they’re choosing to stay silent – an important distinction. I’ve just read that the film was marketed as a “docu-comedy”. I guess that’s that. But every time I walk down Orchard Road and see a badly written sign or advertisement, I think the joke’s on us now. 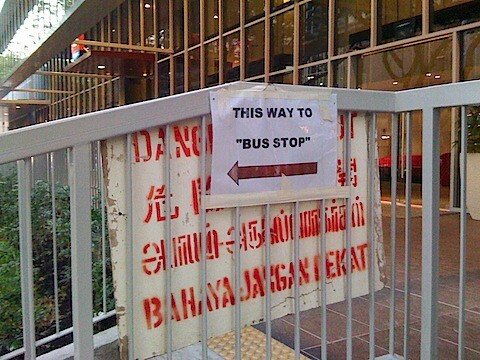 There are just too many examples of English gone wrong in Singapore, and I face them with a combination of anger and embarrassment. No longer apathy. It shouldn’t be tolerated, and maybe something can be done about it. There’s a gwailoh (foreigner) character in the aforementioned docu-comedy who walks around Beijing in a black trenchcoat, correcting instances of bad English wherever he finds them, talking to store owners and giving them advice. A grammar nazi turned vigilante. I had an idea that we could use something like that here, maybe in the form of a non-profit organization that offers proofing services to anyone producing something for public display, from simple signage to one-sheet flyers. I’m talking about making it easy for anyone to get quick, professional advice (as easy as sending an email?) on whether or not the copy they’re about to print is ready for public display. Considering that we’ve got Integrated Resorts, the F1 night race franchise, and other tourism-heavy initiatives in the pipeline, the net effect of having “clean streets” can be huge for Singapore. Likewise, you can’t expect the standard of English use amongst children to improve when they’re surrounded by poor examples. These services would have to free, of course, so we’re talking either volunteer work, sponsorship, or government funding. This is something I’m going to think about more over the next few weeks and maybe do some plausibility research on. If you think it’s a good idea, I’d appreciate you letting me know. Thanks. 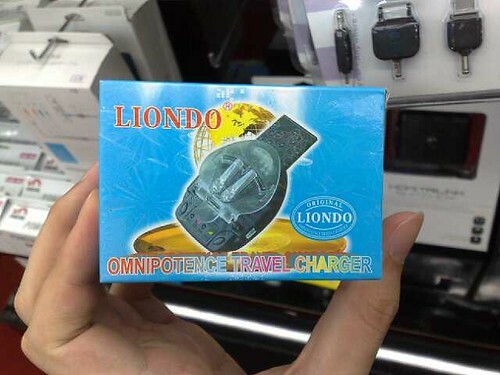 Omnipotence travel charger, originally uploaded by sangsara. Found this fine example of Engrish at Sim Lim Square today.